Dr. Mary Ellen Weber is a consultant in technology innovation, strategic communications, and high-risk operations through her company Stellar Strategies. She also serves on the NASA Advisory Council Committee on Technology, Innovation and Engineering, which advises NASA leadership on future space technologies. 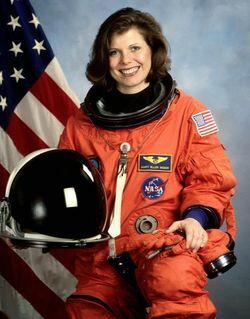 Previously, Weber was a NASA Astronaut for ten years, selected in the 14th group of career astronauts and flying on two Space Shuttle flights, STS-70 and STS-101, including one to the International Space Station. She later served as vice president for nine years at UT Southwestern Medical Center, a world-renowned medical school, research powerhouse, and hospital complex. She has served on a number of prominent boards, such as Texas Health Presbyterian Hospital of Dallas and the Perot Museum of Nature & Science. She holds an MBA from Southern Methodist University, a PhD in physical chemistry from UC Berkeley, and a BS in chemical engineering from Purdue University. Also, Weber is currently an active nationally competitive skydiver and has been for over 30 years—with nearly 6,000 skydives and two dozen medals at the U.S. National Skydiving Championships, and a world record.